Don't really have any additional information on the tower itself but I did see that Houston based landscape architect Office of James Burnett will be doing the landscaping for the building. They also did the landscaping (street and rooftop gardens) on BG Group Place. That's my shout out to some fellow LAs. From their website, looks like Personage of the birds. I won't expect it to look as great in the rendering based on their uptown building. It is Personage And Birds, located on the plaza in front of Chase Tower across the street, and therefore in the rendering of the building. Why does the rendering only show the bottom of the tower? I thought that was pretty odd myself. My guess: The top is secretly going to be the eye of sauron in mordor. How about if Halliburton is the lead tenant and it has the eye of Cheney? sorry pal, that is in direct violation of the CBD building signage and lighting ordinance. 33 floors... 3000 feet. Yep. Checks out. 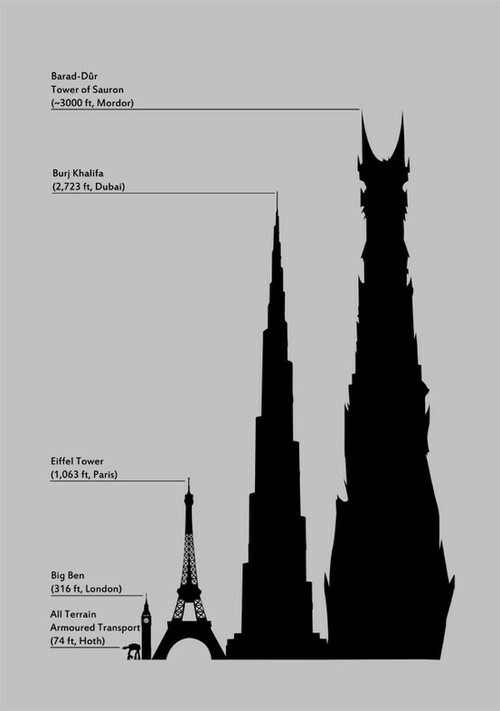 We got ourselves a new supertall guys! Can't wait to see a mockup of the skyline with this! What a waist, you cannot see it behind Pennzoil Place each building is 36 floors. They should build a taller one to make a impact on the skyline. ^ This pretty well sums up the difference in the health of Houston's downtown office market vs Dallas'. We whine about 33 story buildings being too short. Folks in Dallas are ecstatic about a 16 story building. Your right downtown Dallas has a low occupancy. Buildings are empty and they built the towering inferno for 1 million a piece. It is so ugly. I heard it was ruining the park below because of the blare. Holy Cow! You aren't kidding. That tower may ruin everything around it. Not too terriblly disappointed in the height (it will still slightly edge out the Esperson Tower from my POV and still be in the foreground of the Chase tower); again just hoping for an interesting roof line. then prepare to be disappointed. There is a gap between Pennzoil and JPMorgan coming from I-45. The owner of the Houston Club building is planning to replace the decades-old structure with a soaring glass and stone office tower that would stand atop a sleek tunnel- level lobby visible to pedestrians on the streets above it. 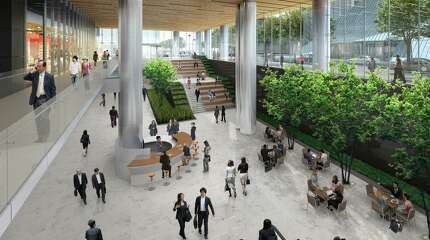 The space, designed to be a bright and inviting gathering spot, would be connected to the building's first floor by a wide interior staircase flanked by trees and other greenery. 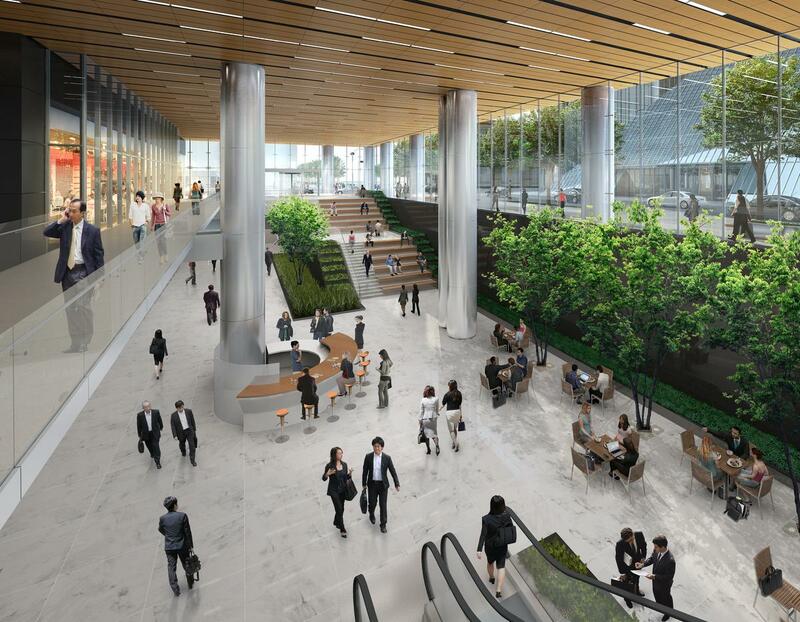 "Not unlike the Spanish Steps in Rome, it will be a great meeting place," said Jim Furr, managing principal of Gensler, the architecture firm that designed the 34-story tower. The developer, Skanska USA Commercial Development, unveiled renderings of the proposed building to the Houston Chronicle on Wednesday. 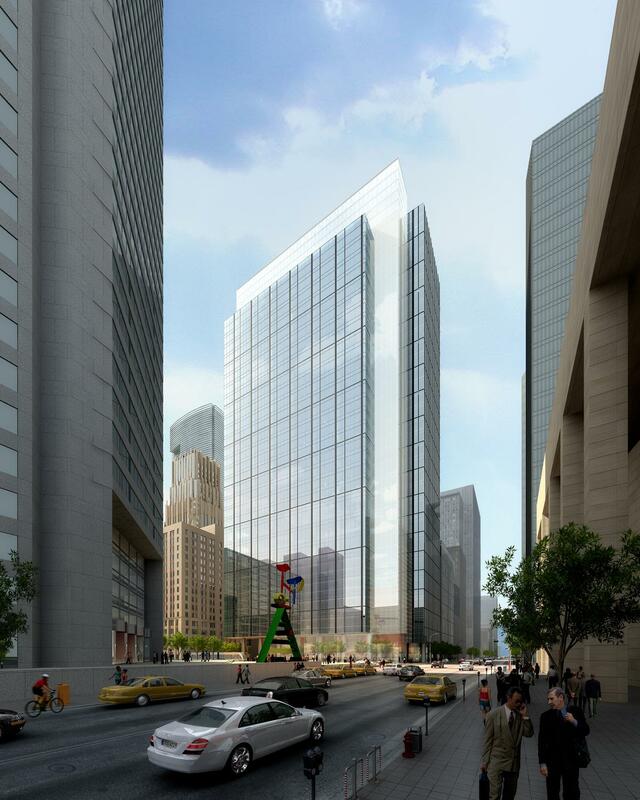 The new tower would mark a significant transformation of the site, which now contains an empty 18-story office building with two smaller adjacent structures. It would also address a downtown issue, recently highlighted by Mayor Annise Parker, of improv­ing connections between the city's streets and its tunnels. "There has to be better, more visible open connectors between what happens at the street and what happens in the underground," Parker said to a group of downtown property owners earlier this month. The new building, currently referred to as Capitol Tower, would contain 700,000 square feet and was designed to meet high standards of environmental sustainability. Its exterior would feature a "light box" effect, where a portion of the building would glow at night and have a unique reflection during the day. The north side of the building would offer shade from the sun, which could make the ground level attractive to a restaurant with an outdoor patio. The tower is still in the planning stages. Skanska said construction likely would not start before a tenant is found for a significant portion of the space. Now that the last of the Houston Club building's tenants have moved out, interior abatement and other demolition work are about to start in preparation for demolition. 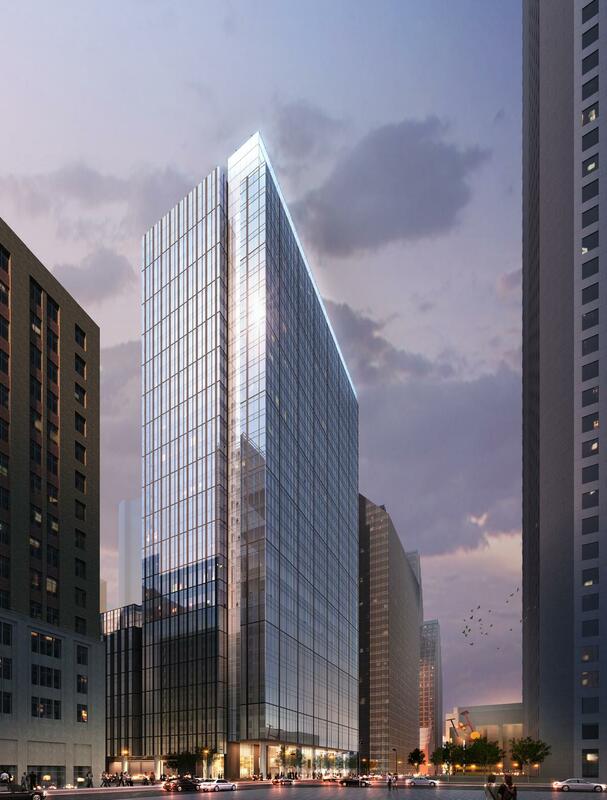 Instead of being imploded, the building will be dismantled floor by floor, similar to the relatively recent deconstruction of an old Sheraton hotel on Polk in the southern portion of downtown. Skanska plans to salvage the Houston Club building's steel and concrete and is hoping to reuse some of the old marble and stone in the new tower. Michael Mair, executive vice president and regional manager of Skanska USA Commercial Development, said the company evaluated the building's historical significance when it considered taking on the project. "It does not sit in a historic district. It's not listed on a registry, nor has it been nominated to be on a registry," Mair said. "The building is vintage, but only to 1955." As it exists, he said, the building is "functionally obsolete." It has shallow floor-to-ceiling heights, small windows and outdated mechanical systems. "The building itself doesn't offer an architectural advantage like, say Esperson or 712 Main," Mair said. Other big changes are a part of the redevelopment plan. The pocket park on the northwest corner of the block would go away as the new building and parking garage would encompass the entire block,which is bounded by Capitol, Rusk, Milam and Travis. The park property is owned by Skanska. The entrance of the building, too, would change from Rusk Street to Capitol, reflecting the building's proposed new name. That name, however, could well change once a major tenant signs up for space. The entrance would face the new light rail line and the plaza outside the JPMorgan Chase building. "Our tenants will have unobstructed views to the north," Mair said, noting that the open space in front of the Chase Tower and the nearby performing arts venues don't stand as tall as most downtown buildings. "It's a fabulous, unique site," he said. lol. Alright buddy, calm down. I can dig it. Even if the design comes cheapened down (like their Uptown Building), I think it would still look decent. A shame it's not 40/45 stories, and slightly thinner. My thoughts exactly. I'm not quite sold on the criticality of connectivity between street and tunnels, but this seems a logical location for a tunnel-street hub. Overall the tower is better looking than I might have expected. Another boring-looking building for downtown Houston. I like it well enough. Not Spanish Steps level excitement, but a decent replacement. I'm still inerested in what will behappening to the tunnels trans-abatement/demolition, but given the indefinite timeframe, it could be a while before we worry about it. Although the building looks just "okay", I'm curious what they mean by this feature. Sounds interesting. Not bad, I like it, for a box. Kinda looks like a glass version of a few of the box buildings in downtown built within the last 15 years. Sad most likely only one or two of these will be built. I hope this is the third or fourth of the office ones planned that goes up. Another shot fromt eh Swamplot piece. I took it to mean "glass". It seems like in the architecture world, light blue reflective glass is all the rage. 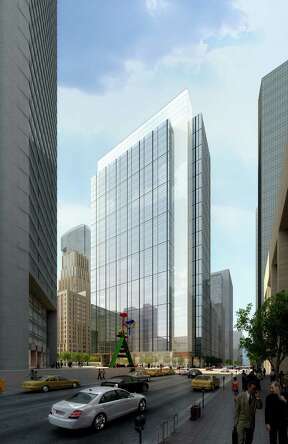 Thats what, 5 high rises planned/underconstruction for downtown Houston with similar glass color? I thought I read once that it is a function of whatever coating/tinting that gets you the optimum mix of reflection/insulation/cost, a substance over form type of decision. Could be just the style though, I'm not sure where I picked up the idea. That's hilarious... they are describing glass? Well alrighty then..
At least they made an effort to hide the garage from the looks of this rendering. Boring glass box is boring. Yeah, it's not bad, but considering this thing will be blocking certain views of the Pennzoil Place towers, then shouldn't it be better than just not bad? It's just a matter of fashion. In the 1970s and early 80s the rage was for bronze-tinted glass or brown buildings. Think of the Kirby Building, Pennzoil, 1100 Louisiana etc. In a few years bluish-tinting will look tired and dated. I don't personally think so, Look at 1400 Smith St. Build in 1983, the light blue glass has stood the test of time. I'm excited to see what tomorrow's trends are, but I don't think they will ever look dated. Unless every city starts getting the futuristic skyscrapers (Halo Reach), Where it's half white concrete and half glass. The upper levels of 1400 Smith St. has had problems sheeting water off and it's blue glass has some pretty noticeable calcium deposits and what looks like some sort of funky mullion mold. It helps that it's neighboring towers are mostly stone clad, bringing it's glass facade to the forefront of perception but it's still a very 80's tower IMO. True... The White stripes are a little 80's. Do you think Wells Fargo could pass for 2013 if it's glass was light blue? No, it's all in the mullion details. 70's & 80's mullions look much thicker (and typically had exterior caulking for it's flashing) than the newer designs which usually have a proportional assortment of flashed interlocked detailing (most notably the use of striated spandrel glass) yielding a more varied facade relief in elevation. See for example the Metro bldg, the Leland bldg renovation, 1400 Louisiana, Hess tower, and the presumable design basis for the Capital Tower, 1000 Main St.
Is this replacing park with mural on side of adjacent building? Across from Pennzoil? This building looks like it could be Anadarko III in The Woodlands. As much as I like the "park" and the mural, I love the location of this building.